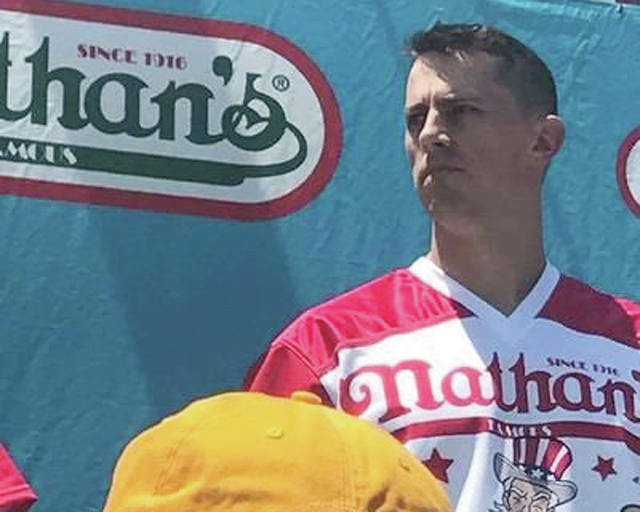 Provided photo Vandalia resident Derek Jacobs looks out into the crowd before competing in last year’s Nathan’s Famous Hot Dog Eating Contest in New York. He’ll be competing again in this year’s competition on the Fourth of July. Provided photo Vandalia resident Derek Jacobs celebrates after winning a Nathan’s Famous Hot Dog Eating Contest’s regional qualifier last year in Cincinnati. Jacobs won this year’s regional qualifier, earning himself another trip to New York for the international competition. VANDALIA — Like millions of Americans, Derek Jacobs plans on enjoying some hot dogs this Fourth of July. For while most Americans plan on downing a dog or two while celebrating American’s birthday, Jacobs plans on eating around two dozen of them in just 10 minutes. This will be his second year competing in New York. To get there, he first had to win one of 21 regional qualifiers held around the nation. Jacobs has won the Cincinnati qualifier each of the last two years. Last year, he qualified by scarfing down 23 hot dogs, then ate 20.5 hot dogs in New York. This year, he qualified by eating 25.5 hot dogs. For the sake of comparison, last year’s winner, 10-time champion Joey Chestnut, ate a record 72 hot dogs (and buns) in the 10-minute time limit. Jacobs said he had never planned on becoming a competitive eater; it just sort of happened. “Yeah, I’ve always been a relatively big eater,” Jacobs said. “Ironically, I really started eating a lot when I lost a bunch of weight a few years ago. I dropped about 40 or 50 pounds from 2014 to 2015. I started eating a lot healthier, a lot cleaner foods. I would have one big meal, which I would eat right after I worked out. And so began Jacobs’ eating career. Initially, Jacobs only took on restaurant challenges, not competing against other eaters, but simply against the clock and his own stomach capacity. He would travel to various restaurants that challenged eaters to consume massive amounts of food in a set amount of time. Typically, the prizes would include a free meal and shirt or other commemorative item. So far, Jacobs’ record in restaurant challenges is 85-2-2. He’s won 85 times, lost twice, and lost twice but came back at a later date to redeem himself by completing the challenge. Some of the things he’s eaten include a 6-pound burrito, 8-pounds of chili, a 72-ounce steak dinner and a 15-scoop ice cream sundae. “I get to travel a little bit for work, so I’m always checking the website (www.foodchallenges.com), looking for new challenges,” he said. Along the way, he also started competing in eating contests, in which he tries to out-eat others competitors. He’s won everything from the pumpkin pie eating competition at last year’s Ohio State Fair to a Rock-n-Green Tomato Hamburger eating contest. All of this has culminated in his trip to Nathan’s Famous Hot Dog eating contest the past two years. For those who do not follow competitive eating, Jacobs doesn’t look like a person who would typically consume pounds of food in mere minutes. He’s 6-foot-5, 200 pounds, is a workout fanatic and recently competed in a Spartan Race. Jacobs said he not only works out, but eats healthy throughout the year. As competitions get closer, he said he’ll often start “training” and stretching out his stomach. Still, though, Jacobs said he does occassionally have to reassure people he’s not going to clean out their pantry should he get invited over for dinner. Jacobs and his wife originally are from Illinois, but moved to Vandalia so she could work in animal nutrition — an ironic career choice given her husband’s hobby, Jacobs readily admits. He’s a structural engineer. He says his family is supportive of his second career. Jacobs donates all of the money he wins in eating competitions to local food pantries and the Ronald McDonald House. Jacobs said he has no delusions about winning the Nathan’s Famous event — he’ll likely finish around 40-50 hot dogs behind the top competitors — but is looking to enjoy the pageantry and have a good time. https://www.vandaliadrummernews.com/wp-content/uploads/sites/19/2018/07/web1_hotdog1.jpgProvided photo Vandalia resident Derek Jacobs looks out into the crowd before competing in last year’s Nathan’s Famous Hot Dog Eating Contest in New York. He’ll be competing again in this year’s competition on the Fourth of July. 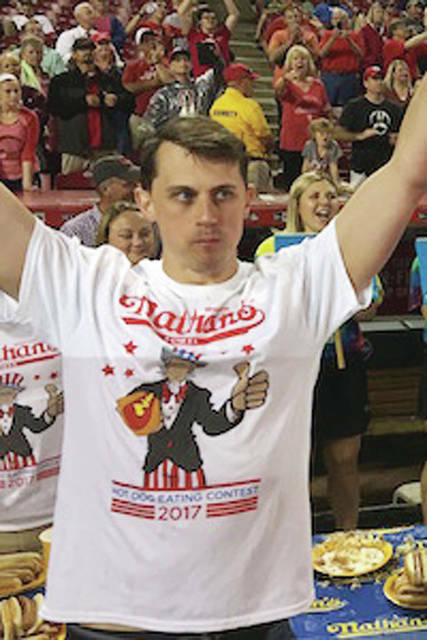 https://www.vandaliadrummernews.com/wp-content/uploads/sites/19/2018/07/web1_hotdog2.jpgProvided photo Vandalia resident Derek Jacobs celebrates after winning a Nathan’s Famous Hot Dog Eating Contest’s regional qualifier last year in Cincinnati. Jacobs won this year’s regional qualifier, earning himself another trip to New York for the international competition.